My mother-in-law was visiting a few weeks ago and she mentioned to me that she’d tried a baked chicken recipe from the side of a box of corn flake crumbs. They sell corn flake crumbs?? I guess it shouldn’t have surprised me. It’s no different from graham cracker crumbs and I’ve been buying those for years. Still, I’m not much of a cereal eater and I’d never been all that enticed by corn flake chicken, although I’d heard lots of people really like it. I was intrigued to see what else they suggested to make with these crumbs so I picked up a box. 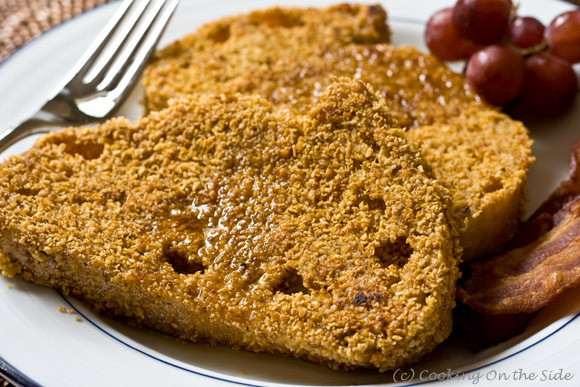 Of the five recipes featured on the corn flake crumbs box, the one for Crispy French Toast stood out most to me. I’ve had French Toast stuffed, grilled, souffléd, bread pudding’d – why have I never had it dipped in crispy stuff? That actually sounded like a pretty good idea. And after trying it, I can tell you it’s an excellent idea. The best way I can think of to describe the taste is “donut-like”. You get the crispy coating on the outside and on the inside it’s spongy, sweet and cinnamony. It was pretty fantastic. I’ll say it – I’m now a corn flake crust fan. So much so that I ventured to try the baked chicken recipe my mother-in-law told me about. Stay tuned later this week to see how it turned out! Place corn flake crumbs in a shallow pan. Set aside. In a medium bowl, combine milk, eggs, sugar and cinnamon. Dip bread into egg mixture, coating both sides of the bread. 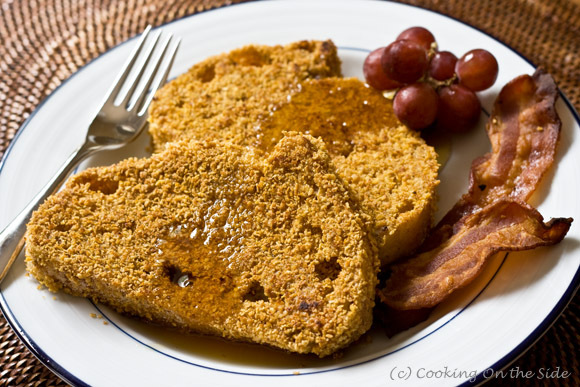 Coat bread with corn flake crumbs. On a grill or in large fry pan coated with cooking spray, cook bread on medium heat until both sides are golden brown, turning once. Serve hot with warm maple syrup. You know… initially looking at the picture, I was mildly underwhelmed by the idea… But your description and the recipe… wow. It actually sounds REALLY good! I may have to try that one out! I’m actually excited about finding your blog, and can’t wait to read more as they come!